Illustrator and picture book author Helen Stephens will be one of the facilitators at the upcoming SCBWI Picture Book Retreat for Illustrators and Writers. In this exclusive interview for Words & Pictures, Anna Violet delves into her processes and techniques. Helen Stephens has worked as an author and illustrator for about 15 years and lectures at the MA course in Children's Illustration at Anglia Ruskin University, Cambridge. She has written and illustrated many books, including Fleabag, The Night Iceberg, The Big Adventure of the Smalls and How to Hide a Lion. She has also illustrated books for Roger McGough, Sophie Hannah and Michael Morpurgo. 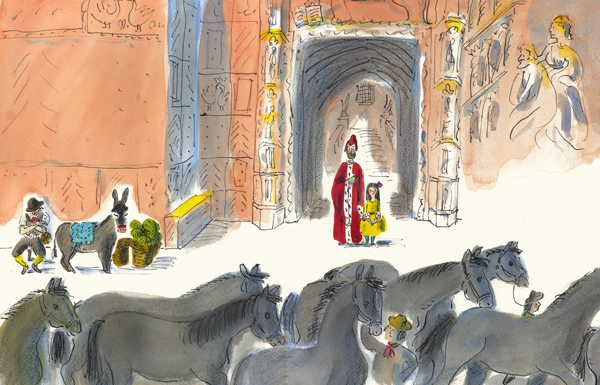 JoJo and the Melon Donkey (written by Michael Morpurgo) will be published this August. Your picture books always start with a drawing from life. 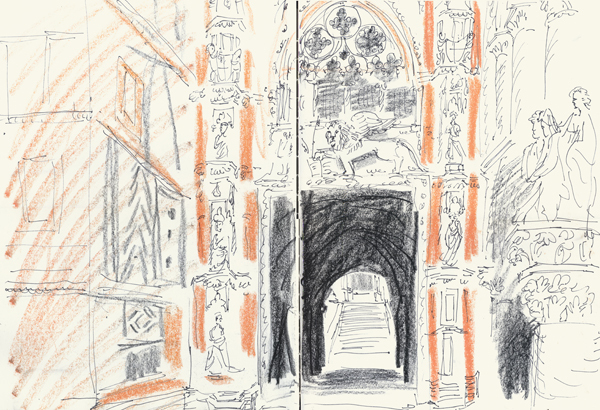 Could you talk a little about your sketching processes? 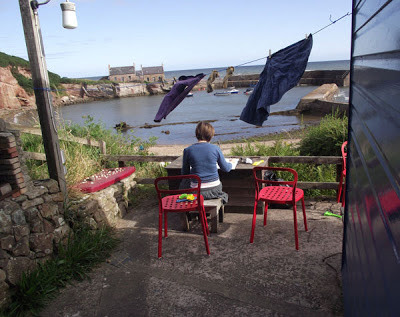 For example, are your characters and settings always (at least initially) drawn from real life? 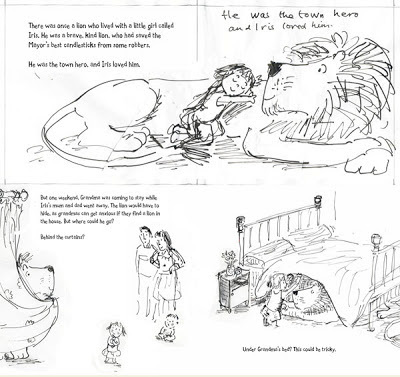 How do you translate your sketches into your final picture-book spreads? 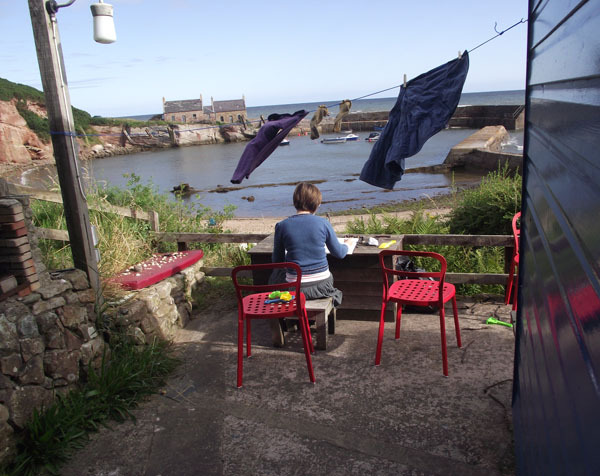 What sketching kit do you take with you when you go sketching on location and how do you deal with unwelcome attention? Drawing from life is an integral part of my work; it’s where all of my ideas start. I usually take a sketchbook, a small one if I want to draw unobserved, or a big one if I know I'll have room to spread out and take my time. I usually limit my materials to a few coloured pens, and a dip pen and ink. Strangely enough, my best drawing happens when I am uncomfortable. If I feel time pressure, or I’m freezing cold, or getting in the way of passers by, then something interesting usually happens. It's something to do with thinking less about getting the drawing technically correct, and just reacting in a more instant way. I enjoy it if people stop to chat, or look over my shoulder, it's all part of the fun. But if I really don’t want to speak I have my ‘Don’t talk to me!’ body language, it usually works! Sometimes the drawings stay in my sketchbook for months or years before I realise I have a character or story idea, sometimes the drawings just stay in my sketchbook, and that’s OK too. It’s rare for me to illustrate someone else’s text, but recently I was asked to illustrate a Michael Morpurgo story. It was set in Venice, so to find my way into the story I went drawing in Venice. Some of the sketches I did there almost became the spreads in the book. It was such a pleasure to illustrate. I am now working on another Michael Morpurgo book set in a small village in Switzerland, so I’ve just come back from a drawing trip there. The interplay of words and pictures works so well in your picture books. At what stage do the words come into your books? Do you start off with a large word-count that gets pruned down as the pictures develop, or do the words gradually build-up along with the pictures? I usually start by playing. This involves drawing a character in different poses and situations and seeing what happens. I add words here and there and gradually the words and pictures develop into a story. It’s not always easy, there are lots of ups and downs, sometimes I think the idea will go nowhere, and then suddenly I have a breakthrough. I rely a lot on the honest opinion of a good editor too. I have a great editor in Alison Green and a good designer, Zoë Tucker. If I am stuck we get together and fire ideas around, it’s lots of fun and we laugh a lot. I then take the ideas home and start drawing again, and a story might evolve in this way. The words and pictures happen together, I don’t write and then draw. I don’t write a long text then edit it, the words happen at the same time as the pictures, constantly changing, often doing hundreds of drawings and rewrites until the whole thing starts to work. I scan roughs in, then chop and change them on photoshop, then make a pdf so that I can see where the page turns are and how they work. I often make paper dummy books too. Your illustration style is so fresh and lively, it almost looks effortless. You often leave white spaces around your characters and use swathes of yellow that bring in the light. Reviewers of your books also talk about your timeless style, with traces of Edward Ardizonne and Ludwig Bemelman. Do you use any favourite tools or processes? Do you use a computer at any stage to refine or tweak your images? I understand you completely changed your illustration style a while ago. What led to this and what was your style like before? I am so pleased to hear my work looks effortless. It is only after a HUGE amount of effort that the drawings eventually become effortless! It’s all in the preparation. I draw as much as possible from life, then do so many rough drawings, that by the time I start the book I know my subjects inside out. The final artwork happens very quickly, I might do it a few times and choose the best one. I stand up to draw, that helps keep the drawing fluid. I use a dip pen and a bottle of ink because it gives me less control, I like that. I changed my method of working a few years ago. I used to work in flat brightly coloured acrylic paint. It was great for baby/toddler books, and they sold really well, but it gave me no scope for drawing depth and emotion for older children. I eventually felt trapped by ‘a style’. So I stopped taking on new commissions and took a year out. I went back to my sketchbooks and developed a new way of working. Now I don’t feel I have a style, I don’t even like that word really. I try to look at each book as an opportunity to learn something new. Having a style can stifle that creativity I think. Which illustrators and writers have inspired your style and way of working? Do any contemporary illustrators and writers inspire your work now? I have a varied taste in children’s books; I like everything from Ardizonne to Charles M. Schulz. I like lots of the illustrators from the 1950’s including Roger Duvoisin and Jean-Jacques Sempé. I love Ludwig Bemelmans, I just read his biography and it was good hear that he too did thousands of rewrites and rough drawings, and drawing from life. It was good to hear that, very affirming! I also love John Burningham, I like the spontaneity and the emotional pull of his drawings, and his words and pictures work so well together. I also love Bruce Ingman. His line is so individual, naïve but sophisticated at the same time. Your agent is Hilary Delamere from The Agency. Do you think it is important for a picture-book illustrator/author to have an agent? I don’t think an agent is vital. I managed without one for the first 10 years. But I couldn’t manage without Hilary now; she does all the paperwork and chases up contracts etc. It saves me doing all that difficult stuff, so that I can get on with the creative work. It’s good to have someone to talk through problems with too, or make plans. I understand you also work for French Children's magazines. Can you tell me a bit more about this? I often do illustration work for Bayard Presse, they publish magazines for children covering lots of age groups. I’ve been working with them for about 12 years. They are lovely to work with, it’s usually quite a quick turnaround from brief to final artwork, and I like the change of pace compared to writing a picture book. It’s also lovely to see children’s magazines that are so full of beautiful illustration, for boys and girls alike. I get depressed when I go to my local newsagent to buy a magazine for my daughter, everything is marketed towards either boys or girls, lots of pink for girls, and terrible cheap trashy freebies. My daughter loves it when the Bayard Magazines arrive, we pick our way through the stories using my very limited French, and then set to work making the paper theatres that appear at the back for the magazine. They are a real treat. Your partner, Gerry Turley is also an illustrator, and he will be a fellow facilitator at the upcoming SCBWI Retreat. Do you inspire each other or work together on any illustrations? Yes, I suppose we must inspire each other, but our work is not visually similar. We both like to draw from life, so our work has a similar foundation in life drawing. We talk through our work with each other sometimes, but don’t really give each other advice, that would be too intrusive and lead to rows! Gerry has a book coming out next year called Woooo!. He used a mixture of screen-printing and photoshop layers to make the artwork, it is beautiful. He has influenced me with this actually, because I have started to do some screen-printing, although it hasn’t appeared in my books yet. I am about to do a follow up to How to Hide a Lion called How to Hide a Lion From Grandma, a new Michael Morpurgo book set in Switzerland, where I went to draw earlier in the year, and a few other exciting things too. A very busy year ahead! Thank you Helen for sharing with SCBWI your journey into picture books. Anna Violet is a freelance author-illustrator based in Manchester. 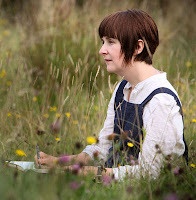 She won the Undiscovered Voices Tribute competition 2010 and was Featured Illustrator 2011. She illustrated a young readers book, How Anansi Got His Stories (Oxford University Press) in 2011. Check her portfolio website here, and her blog here. This is lovely Anna and Helen. Thank you so much Helen, for this interview. 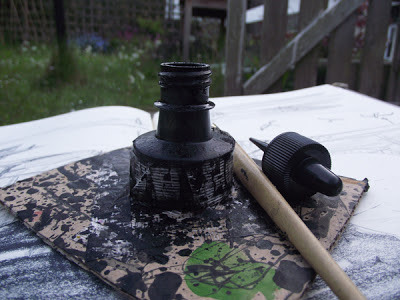 I found this really interesting: "I use a dip pen and a bottle of ink because it gives me less control, I like that. "I've been learning recently how letting go is so important when I'm writing. And I love your lion, especially under the bed! A great read Anna thanks. Its good to 'get under the skin' and see how other illustrators work.